The first of the ‘B’ ranking points events, the ‘B’ League Doubles failed to attract a big entry as only 15 pairs came forward. Players should understand that when the East teams to play the West is selected, only players with ranking points will be selected; there are no wild card entries for the ‘B’ select teams. Anyway, as it turned out, it was a very good competition with some very good pairings. Only St Ola didn’t have any entries, and after some very good games, the final saw the Nomads pair of Brett Dickinson and Gary Wilson fare up to the new pairing of Quoyburray’s Davie Henderson and Robbie Norquoy of the Tankerness team, and it was the boys from the East who won at a canter five nil. Things are hotting up in the Williamsons ‘A’ League as the Legion sat out their no game week, the rest took the chance to do some catching up and all three chasing teams did just that. Leading the way and closing up to within their points was the Commodore as they whitewashed Quoyburray ‘B’ 12 nil which now gives them a better games difference than the Legion. Level on points in second equal are the Golf Club, after an 8-4 win over Sands 2. The same score for Sanday as they beat Warriors who have gone off the boil lately. Another great win for the Untouchables as they put eight past the Wanderers for the loss of only 4. The other Untouchables team are still going strong with an 11-1 defeat of the Legion Arrows. There is now only three points covering the top three, with the next two teams a further five points away. At the other end, Sands 2 are three points behind the two second bottom teams, the Wanderers and Legion Arrows, also along with Quoyburray ‘B’ could be the four teams fighting of relegation, however some of these teams have to play each other. Things are also hotting up in the Williamsons ‘B’ League as the only team with 100% record in the ‘B’ league crashed to Tankerness 7-5 they are Quoyburray but still lead by three points as the Bilco Boys also lost out to Shapinsay 8-4. Tankerness is five points behind and still undefeated but have two games in-hand which must be played before the festive break. The Murray Arms are still very much in the picture after an 11-1 defeat of the Motorhoose who have faded a bit of late. Also an 11-1 win for the Nomads over the young boys of St Ola ‘B’. The St Ola v Vikings game was postponed. 180’s from Jamie Drever, Jim Brown, Wilfie Tulloch, Colin Kirkpatrick, Colin Barnett, Cammy Scott, Trevor Shearer, Eddie Drever, Ivan Leslie, Alan Gray, Mark Shearer, Derek Firth, Craig Moar, Brett Dickinson, Robbie Norquoy, Davy Mowat and two from Davy Henderson, Willie Bremner and Ian Wilkie and three from Robbie Stanger. 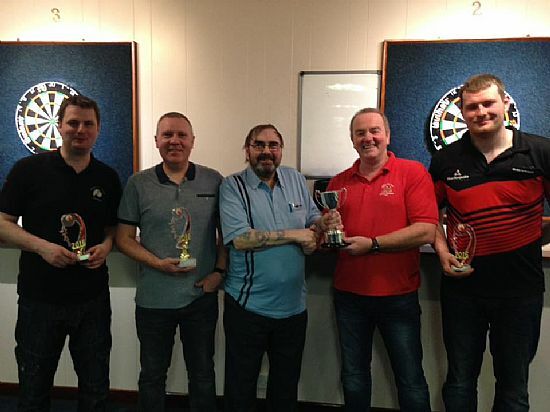 High Checkouts of 100 from Aaron Edwardson, Derek Firth, 101 Brett Dickinson and Leigh Shearer, 111 Kenny Gilespie, 114 Michael Moodie, Ian Wilkie and Ryan Tulloch, 116, 120 and 120 Alan Gray, 118 Davy Henderson, 120 and 156 Robbie Stanger, 174 from Colin Ross and Ian Wilkie and Eddie Drever had a 14 dart leg, with Leigh Shearer hitting a 15 dart leg. It’s back to ranking points again on Friday night with the Jim Scollie Masters Singles in the Legion, names in by 7.30pm and it is for registered players. It’s the third of the seven ranking point events and with Shetland coming a calling next year for the 45th game between the old enemy, every player will be keen to get involved and you can only be if you enter the ranking points events. The Orkney boys will be trying to make it seven in a row after winning the last six. Time to get the raffle tickets back to the treasurer. ‘B’ League Doubles Final: Davy Henderson and Robbie Norquoy beat Brett Dickinson and Gary Wilson 5-0. Williamsons ‘A’ League: Warriors 4, Sanday 8; Untouchables 8, Wanderers 4; Untouchables ‘A’ 11, Legion Arrows 1; OGC 8, Sands 2 4; Quoyburray ‘B’ 0, Commodores 12; no game – Legion. Williamsons ‘B’ League: St Ola v Vikings – postponed; Nomads 11, St Ola ‘B’ 1; Quoyburray 5, Tankerness 7; Shapinsay 8, Bilco Boys 4; Murray Arms 11, Motorhoose 1; no game – Muppets. Friday, November 25: Jim Scollie Masters (Ranking), Legion, 7.30pm. Williamsons ‘A’ League: Commodore v Sanday; Quoyburray ‘B’ v Wanderers; Warriors v Legion; Untouchables v Legion Arrows; OGC v Untouchables ‘A’; no game – Sands 2. Williamsons ‘B’ League: Motorhoose v Vikings; Murray Arms v Muppets; Nomads v Bilco Boys; Shapinsay v Quoyburray; St Ola v St Ola ‘B’; no game – Tankerness.